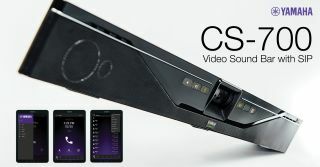 The What: Yamaha Unified Communications says its CS-700 SIP Video Sound Collaboration System is the "first Video Sound Bar to integrate PBX and UC applications to deliver high-quality audio from all communication channels and address video and collaboration requirements from one device". The What Else: The CS-700 SIP furthers the audio, video, and collaboration features introduced in the award-winning CS-700 Video Sound Bar with VoIP capability. "For the first time, customers can bridge together telephone calls and web conferences from a video sound collaboration device. This is a unique feature that's only available through Yamaha," said Holger Stoltze, senior director of technical sales and marketing, Yamaha UC. "It's compatible with any web application, effectively connecting customers' VoIP and UC communication worlds together in the video collaboration environment. This provides an additional value by protecting UC investments and enhancing the PBX network with web collaboration capabilities for a streamlined UC strategy." The Bottom Line: With built-in connections for VoIP and USB for UC applications, users can not only achieve the clearest conferencing audio and video from any unified communications platform, they can also bridge VoIP and USB calls together directly from the device. The product will be shown at Enterprise Connect 2019 in Booth 1027.